I have difficult hair, to say the least. Its crazy curly and throughout my early life I tried EVERYTHING to straighten it enough to be manageable. Nothing ever worked. I even practically destroyed my hair with a variety of chemical treatments. Still not straight. About 10 years ago, I finally gave up the fight and started down the road to loving my hair. When I began learning about herbs and the natural way to do just about everything in life, I made it a point to learn about natural hair products. I have now been making my own hair gel for about a year, but for some reason I never considered trying hairspray. Early this month, when my husband and I were sick, we picked up a bag of organic oranges at the grocery store. I took one with me to my day job and cut it open to find out that it was not an orange at all. In fact, it was a grapefruit. Gross! I am not a big fan of grapefruit, in fact it’s pretty safe to say I detest the taste of them. I do use the essential oil in a few oil blends, and I like grapefruit in some bitters that I use. However, I was now the proud owner of an entire 5lb bag of grapefruit. There’s only so much grapefruit bitters I can make, and I do not have the proper licensing to make my own essential oils. So I started looking up alternative ways to use grapefruit and found a few recipes for hair products. After looking at several recipes, some of which did not include grapefruit as an ingredient, I came up with a recipe to test out. Let me tell you, this hairspray really works! I washed my hair and left out my usual gel, instead I sprayed my hair with this homemade hairspray and let it dry. No frizz, nice hold (without the usual crunch that gel leaves), and smells great! So I’m sharing this wonderful recipe with all of you in hopes of spreading the joy of homemade, good for you, hair products! Grapefruit promotes hair growth, removes buildup, naturally lightens hair color (any citrus fruit does this, but it works best with just the juice, adding the grapefruit to your hair recipes do not lighten to the same degree), detangles, treats dandruff, and makes your hair shine. It’s also great for those of you who have oily hair. Coconut Oil is an ingredient I added to the recipe because grapefruit can strip your hair of oils, and my hair is quite dry (like most curly hair is). Small amounts of coconut oil can also help reduce, or even prevent, frizz. But if coconut oil is not for you then you can substitute argan oil, avocado oil, or even olive oil. Honey is great for your hair, it nourishes your hair to make it shine. It also makes a great moisturizer because it attracts moisture. So for my fellow Florida girls, honey is great because it uses the humidity to help your hair! High Proof Alcohol is my preservative in this recipe. However, small amounts of alcohol can also make your hairspray work better. While larger amounts of alcohol can dry your hair and create frizz, small amounts of alcohol can help ensure an even spread of your hairspray for a better hold. It can also decrease the time it takes for your hair to dry. Essential Oils not only make this hairspray smell great, but they can also help your hair needs. Some good essential oils to look into include: lavender, geranium, vetiver, cedarwood, rosemary, sandalwood, chamomile, and clary sage. Combine water and grapefruit into a pot and boil on medium-high heat until the liquid is reduced to half. Reduce the heat to low. Remove the grapefruit quarters, squeezing until all liquid is squeezed out. Add in the honey and coconut oil. Cook on low, and stir until coconut oil and honey are well incorporated. Cover and remove from heat. Let cool, but don’t let the solids form completely on top, if this happens, just heat up on the stove until melted. Using a funnel, pour cooled liquid into container of your choice. Add in the alcohol and essential oils. Close up with a spray top. Shake well, and shake before each use. This recipe will last for several months, however if you think it is beginning to smell funky, throw it away and make some more! 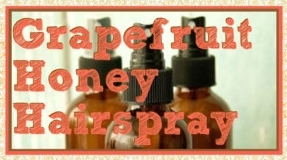 I hope you enjoy making your own hairspray and let me know what you think in the comments below!